It’s nearly impossible today, surrounded as we are by digital cameras in our phones and every other device, to appreciate the astonishment that Polaroid photography produced when it was introduced in 1948. “Take pictures and see them completely finished in only 1 minute – if it isn’t just the way you want, shoot another one immediately.” That’s the lead sentence in the copy. Who of us could even wait one whole minute today? But in 1953, your typical camera shot between 12 and 24 photos on a roll of film which you then dropped off at the local drugstore so they could send it on to Kodak for processing. It might take a week or more before you found out whether your dozen precious images were any good. Today, any iphone can shoot a burst of a dozen photos in less time than it takes to read this sentence. And there are no processing fees. 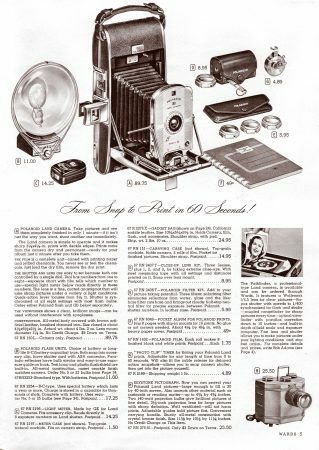 Here’s another thing – In 1953 Polaroid was still selling the same original Model 95 they had first started selling at Christmas 1948. No yearly upgrades with this tech. And considered as tech, all the “high” parts were in the one-minute-developing film. The camera itself, aside from some postwar streamlining, was not much different from a typical Kodak from decades earlier, fold-out bellows and everything. The first Polaroid was big and awkward (and pricey). Certainly not something you could fit in your back pocket — or any pocket! — to be ready to snap an image at a moment’s notice. Still, Edwin Land was onto something, with that idea that pictures should be seen and shared right after taking them and not weeks later. It just needed half a century to go digital.